Two reconfigured classrooms are facilitating student collaboration and providing flexible options for teaching and learning. Over the past year, the Information Resources and Technology (IRT) department at Drexel University (PA) has reconfigured two classrooms in its Korman Computing Center, Korman-111 and Korman-110, for these key reasons: to facilitate student collaboration, and to provide professors with pedagogical choices, as well as a multitude of teaching and student-engagement options. Korman-111 features six six-student "pods." Each pod has its own high-definition (HD) flat panel screen, which can display any student computer screen from that pod. Student groups can alternate pod displays on the fly. Up to six student groups can, working collaboratively, view different versions of their work or group project — in a high-tech yet high-touch manner that is virtually impossible to achieve in less-advanced learning spaces. The instructor can view students' progress by visiting them while they work in groups and engage one another at their pods. Importantly, while the professor is lecturing, she or he can ask students to retract their FlipIT computer screens to create a flat table surface for taking notes, reviewing handout materials, referencing their textbooks and the like. Hence, whenever a traditional pedagogical approach is appropriate, such capabilities are preserved. At the front of the room, the instructor has two state-of-the-art flat panel Smart Boards (no projectors needed!). Ancillary, but quite important, are the room's new recessed light fixtures, ceiling-mounted speakers and precisely-positioned omni-directional microphones. Similar to most Korman classrooms, Korman-111 can host HD videoconference or webcast sessions using front- and back-of-the-room HD cameras. The back-of-the-room monitor has a dual function for the instructor or presenter: It can be a confidence monitor(to view how the instructor/presenter appears to remote viewers) or a monitor where she or he can actually see viewers at remote location(s). Until now, Korman-117 was the only classroom in the building that even approached a student-collaboration configuration. The layout positioned students in six six-person groups at dated tables; students took laptops from a storage cabinet, fired them up and connected to their group's ceiling-mounted projector. Students projected their work onto whiteboard walls where they could also make notations and mark up their projected images. Each student group worked in isolation; instructors struggled to showcase work or display progress from any of the student groups. Pedagogically, it was difficult to alternate between lecture and group collaboration mode. Accessing, deploying, storing and/or returning the laptops proved disruptive to the flow of class. These were time-consuming processes for instructors who were already pressed for time in their typical class timeslots. Technological advances in multiple areas enabled IRT to rethink and radically reconfigure many of their learning spaces. Korman-110 is the newest example of the reconfiguration process. 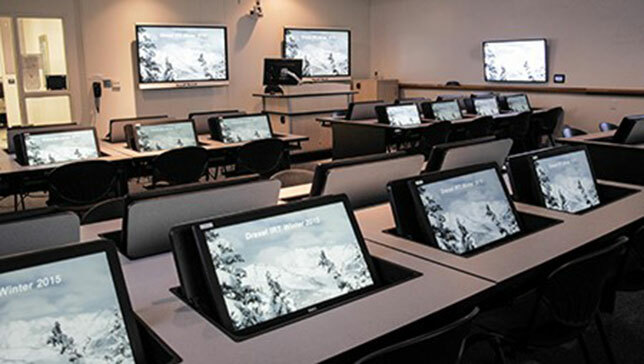 Its student collaboration capability is similar to Korman-111, with four eight-student pods equipped with all-in-one computers and an HD flat panel display. 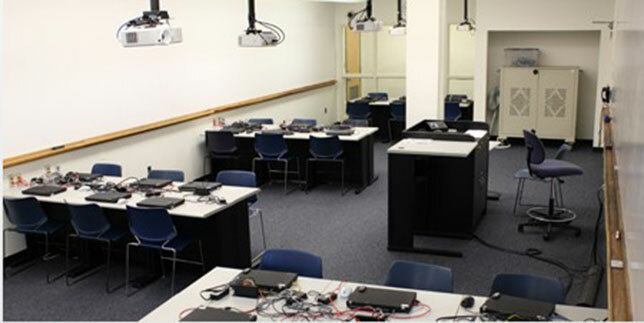 In this room, instructors can tell students to keep their computers hidden during the lecture; students use the FlipIT lids to deploy their computers only when appropriate. Moving from lecture mode to collaboration mode and back again is fast and straightforward, thus maintaining a seamless flow for the class. Students can collaborate and view any peer's work on their group's flat panel screen. A wall-mounted, digital touch panel allows the students to select which of the pod's eight computers to display with one-touch ease. Or, the instructor can tell any student group to select the "Teacher"button to send the group's display to the front screens. Furthermore, the instructor can display her or his content on each pod's monitors, along with those at the front and/or rear of the room. 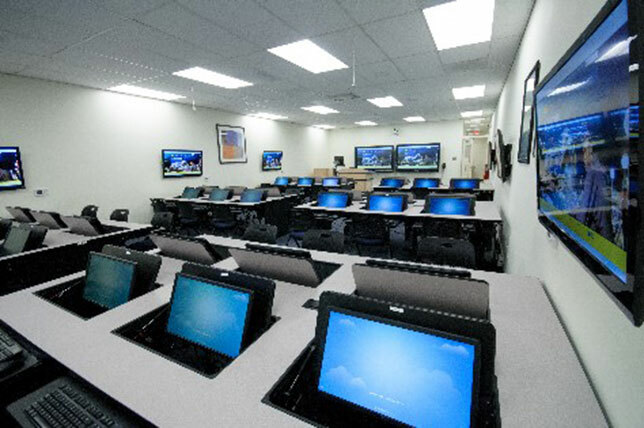 Perhaps the most revolutionary capability in both of these classrooms is the instructor's ability to select a specific student's computer screen to display on all of the pod screens, along with the instructor's flat panels. This enables the instructor to highlight one group's work for all groups to see, alternating from pod to pod using the touch panel on the instructor podium. Hence, the learning space accommodates traditional lectures, collaborative work by each student group and collaborative work by the entire class. The capabilities are numerous and flexible, with many pedagogical approaches possible. IRT speaks with practitioners to gather information on their experiences in the new classrooms, then leverages that input whenever the next classroom is staged for upgrading and/or reconfiguration. The overall benefits have been significant and manifold. For more information, or to schedule a virtual tour, contact the author at (215) 895-0244 or at mikes@drexel.edu.